Ooh! Pancakes? Plain, topped with peanut butter and butter? I agreed. It was, in fact, what I was hoping she’d choose. …what’s an appropriate wine to pair with them. Or perhaps the best hard spirits. Or both. My friends enthusiastically rose to the challenge. Suggestions included hard cider (apple or pear), moonshine, beer, various German wines and a couple of sparkling wines, blueberry schnapps, and “honey-infused rye whiskey.” This bunch clearly takes their pancakes-and-drinking seriously. Or maybe they were just ready to help a friend in need. Now, neither of us is really a drinker. I can mix a Manhattan, split it into two glasses, and there’ll be some left in each glass at the end of the evening. But, as with the one-spoon-sundae that has become a favorite dessert, sometimes just a little taste is enough. Nobody got over-served. We each had just a bit of the sort-of-cocktail syrup over very fluffy pancakes. Even so, neither of us was driving anywhere. The miserable parts of our days faded away in the giddiness of doing something silly in the kitchen, and in its unusual and tasty result. There’s quite a lot of the syrup left, but we’ll probably save it until we’ve both had a really good day at work. 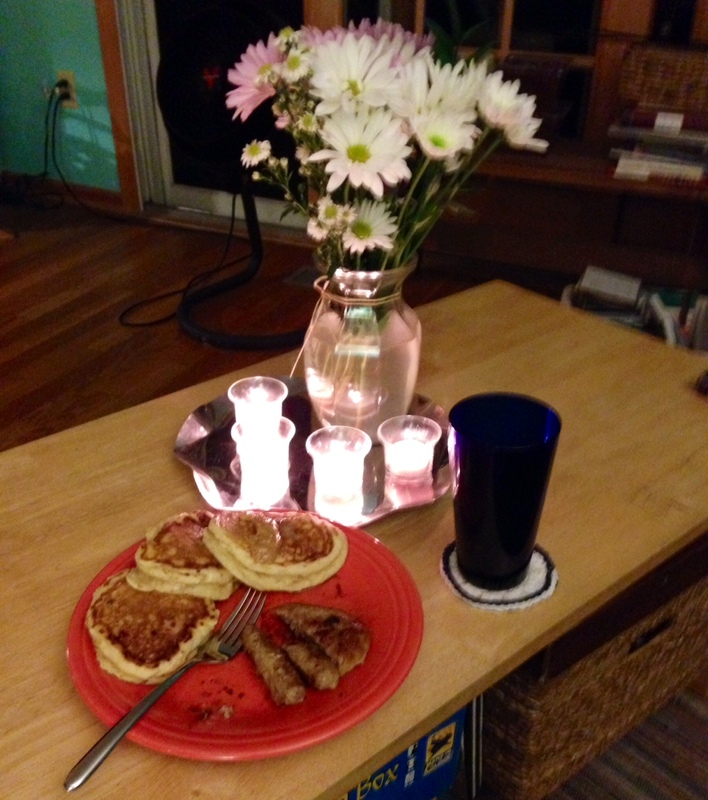 This entry was posted in Uncategorized and tagged Breakfast for Dinner, Cocktails, Comfort Food, Friends, Monday, Pancakes. Bookmark the permalink.